The Tigers won the Series, four games to three, giving them their second championship and first since 1935. The Curse of the Billy Goat originated in this Series. As of 2009, this is the last appearance for the Chicago Cubs in the Fall Classic. Having last won the Series in 1908, the Cubs own the dubious record of both the longest league pennant drought and the longest World Series drought in history. 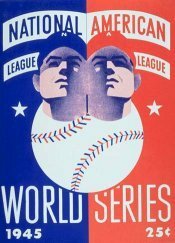 The Series was a rematch between the two opponents of the 1935 World Series. In that Series' final game, Stan Hack had led off the top of the ninth inning of Game 6 with a triple but was stranded, and the Cubs lost the game and the Series. Hack was still with the Cubs in 1945. According to Warren Brown's account, Hack was seen surveying the field before the first Series game. When asked what he was doing, Hack responded, "I just wanted to see if I was still standing there on third base." 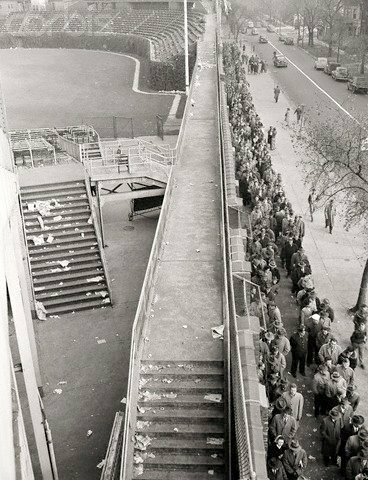 In an unknowing foreshadowing of their future, the Cubs would win two of three in relatively spacious Briggs Stadium but would lose three of four in the relatively hitter-friendly confines of Wrigley Field. The 1945 World Series is referenced in the Steve Goodman song "A Dying Cubs Fan's Last Request" when Goodman says, "The law of averages says, anything will happen that can, but the last time the Cubs won a National League Pennant was the year we dropped the bomb on Japan." The Chicago Cubs finally made it back to the World Series after a seven year absence thanks to the timely pitching of Henry Borowy. Acquired on waivers in late July after he had compiled a 10-5 record for the New York Yankees, the "newbie" proceeded to win eleven of thirteen decisions and helped Chicago fight off the St. Louis Cardinals in the National League pennant race. Their opponents, the American Leagues' Detroit Tigers were a familiar post-season rival. The Tigers were shooting for their second World Series crown; their only previous Series title had come in 1935, against the Cubs. The Cubs were eyeing their third Series championship; their two titles came in 1907 and 1908 at the Tigers' expense. Borowy had more than earned the start for Game 1 and he proved himself again and again as he held the Tigers to six singles and was a 9-0 victor as the Cubs bombed twenty-five-game winner Hal Newhouser. Bill Nicholson singled, tripled and drove in three runs for Chicago, which got two runs batted in apiece from Phil Cavarretta and Mickey Livingston. Virgil Trucks, a sixteen-game winner for Detroit in 1943 (and only recently discharged from the United States Navy), pitched a seven-hitter in Game 2 and won, 4-1, as midseason service returnee Hank Greenberg unloaded a three-run homer in the fifth. Four days earlier, on the final day of the American league schedule and in a game that marked Trucks' only appearance of the regular season, Greenberg smashed a pennant-clinching, grand slam in the ninth inning against the defending American League champion St. Louis Browns. In Game 3, Chicago's Claude Passeau tossed a one-hitter in which Rudy York singled to left field with two out in the second and led the National Leaguers to a 3-0 triumph. Following his teammate's cue, Ray Prim sat down the first ten Detroit batters he faced in Game 4, but after yielding a walk, two singles and a double in what became a four-run fourth for the Tigers, Prim was pulled in favor of Paul Derringer. While Derringer and fellow relievers Hy Vandenberg and Paul Erickson pitched shutout ball the rest of the way, it was to no avail. Detroit's 4-1 triumph, fashioned on Dizzy Trout's five-hit pitching set the tone for the rest of the contest. Now manager Charley Grimm went to Borowy, not once, not twice, but three times. Grimm, in his second year with the Cubs, was obviously impressed with Borowy's combined regular-season record of 21-7, his second-half heroics (which netted him the National League's ERA title with a 2.14) and his 56-30 mark with the Yankees. Grimm's newest "go-to-guy" held Game 5 to a 1-1 tie after five innings in which he matched Newhouser, who had just led the American League in victories (twenty-nine in 1944), strikeouts for the second successive season and topped the American League with a 1.81 ERA. Unfrotunately, it would be his turn to fall short as the Tigers' pitcher would be the one to go the distance. Borowy was pulled after allowing four straight hits at the outset of the sixth as Detroit scored four runs in the inning and swept to an 8-4 victory. Greenberg continued to perform at the plate and slugged three more doubles for the Tigers. Trucks and Passeau went at it for Game 6 and both dominated the other's line-up for over four innings. Trucks blinked first and was routed in the Cubs' four-run fifth which featured Stan Hack's bases-loaded single. Passeau followed his opponent to the dugout in the seventh after Detroit managed to score twice. After the Cubs answered with two runs in their half of the inning, it was 7-3, Chicago. But Detroit struck for four runs in the eighth, the game-tying run coming on a Greenberg homer. Suddenly Manager Steve O'Neill's Tigers were in a position to close out the Cubs in six games. Dizzy Trout came on in relief for Detroit in the last of the eighth, and when the 7-7 game moved into the ninth, Grimm decided to make another pitching change. Having followed Passeau with Hank Wyse (the Cubs' top winner of '45 with twenty-two victories) and Prim, Grimm now wanted Borowy back. Once again, the "newbie" delivered, holding Detroit at bay with four scoreless innings. Then, in the bottom of the twelfth, with two out and Billy Schuster at first base as a pinch-runner (for Frank Secory, who had come through with a pinch single), Hack hit a drive to left field that took a weird bounce and bounded over Greenberg. The hit, ruled a double, scored Schuster and gave Borowy and the Cubs a crucial 8-7 victory. As the Tigers prepared to close the door on the Cubs and the 1945 season, Chicago's newest hero was selected to keep his team alive in Game 6. The Chicago press had questioned the decision and printed that Grimm was making a serious mistake by using Borowy who was going on one day of rest after pitching the final four innings of Game 6. He had also pitched into the sixth inning in Game 5 and many wondered if his arm would hold up. The decision would prove costly as the fatigued pitcher yielded singles to the Detroit's first three batters, Skeeter Webb, Eddie Mayo and Doc Cramer. Grimm, realizing that Borowy had done all he could for the '45 Cubs, told his weary pitcher to call it a day. Paul Derringer came in as relief for Chicago, but by the end of the inning Detroit had scored five runs. The well-rested Newhouser went the distance for the 9-3 victory, allowing ten hits and striking out ten Cubs. Once again Chicago had come up short (their seventh Series loss) and even worse, it was (once again), to the Tigers.